The Cypher System, the game system that powers The Strange, is easy for beginners to learn, but it offers additional complexity for those who want it. Character creation involves making three basic choices, which together say something about the character. It follows the popular Numenera format of “I’m a blank blank who blanks,” with each blank being filled in with a word or phrase that describes your character both thematically and mechanically, because the choices you make tie directly to character stats and abilities. So your PC might be a Clever spinner who Solves Mysteries, a Strong vector who Channels Sinfire, or a Lucky paradox who Practices Soul Sorcery. Those phrases don’t just sound cool, they also directly determine what your character can do in the game! If you’re familiar with Numenera—which also uses the Cypher System—you already know how to play The Strange. The various options are different, but they fit together the same. 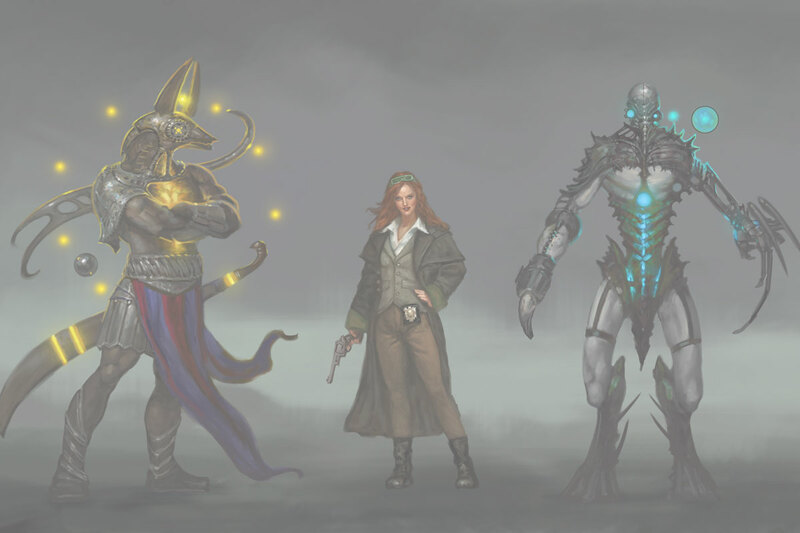 (The Strange has different types, descriptors, and foci from Numenera, but you’ll recognize a few old favorites as well.) An experienced player will find a whole new wrinkle as well, as her character’s focus actually changes based on which world she visits. So a character who is an Intelligent paradox who Shepherds The Dead in one recursion becomes an Intelligent paradox who Integrates Weaponry on another. If you’ve never played Numenera, however, don’t fret. The Strange is a standalone game that includes everything you need to play. 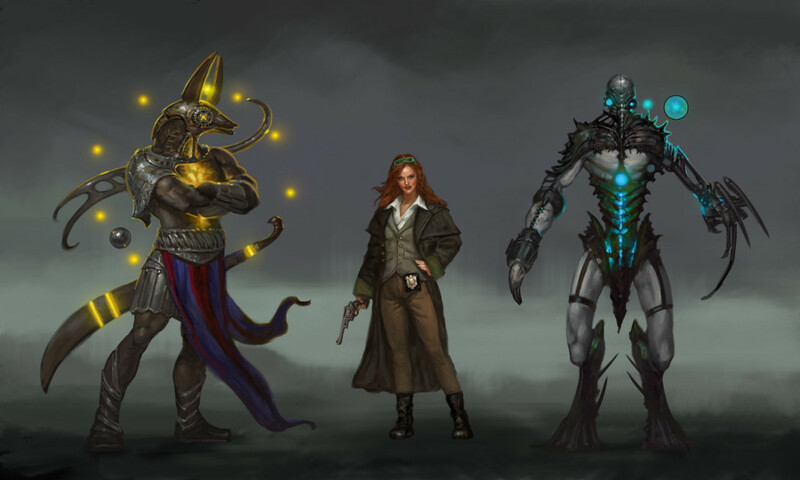 Let’s take a closer look at the basic choices you’ll make when creating a character for The Strange. Vectors are the muscle of setting. Vectors use persistent force to accomplish their goals and overcome whatever problem faces them. Vectors can wear armor and wield massive weapons, or they can fight with light weapons—including the fists, elbows, and knees—without armor so they can move quickly. But vectors aren’t about combat, strictly. They’re about action. They are the kind of people who get things done. Paradoxes are the mad scientists, the sorcerers, and those who break the rules of reality. Whether using science, the power of the mind, spells, or something else entirely, a paradox is not bound by what others believe to be true. These characters tap into the Strange itself in ways that other characters do not. Spinners are striking individuals, and possess a personality that allows them to spin tales, spin lies, or spin a version of the truth that makes others see things in a whole new way. If anyone is going to make a friend of an enemy, bluff their way into a high security compound, or mislead a world-devouring planetovore, it’s a spinner. After selecting your type, you choose a descriptor, such as Appealing, Fast, Sharp-Eyed, Brash, Skeptical, or Strange. A descriptor flavors everything your character does. Finally, you choose a focus. However, your focus changes based on the nature of the recursion you translate yourself to. On Earth, you might have a focus like Works the System, or Is Licensed to Carry, but on Ardeyn your character adapts to that world’s reality and its rules. So now your focus is Slays Dragons or Abides in Stone. On Ruk, you might take on Metamorphosizes or Regenerates Tissue or even something subtler, like Infiltrates. Type and descriptor, then, become your character’s core. Even while equipment, abilities, and appearance change from recursion to recursion, that core identity remains the same. This means that focus is less your identity and more how you interact with the world—whichever world it is—around you.